You will receive 2 - $25 vouchers! Only one voucher per visit, per table. 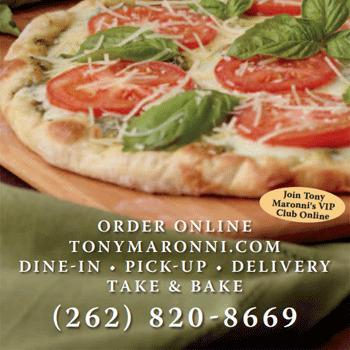 Come taste what everyone is raving about at Tony Maronni’s in Sussex! Famous for their award winning pizza. The menu selection at Tony Maronni’s is huge! Be sure to check out the new appetizer menu and the artisan pizza menu. Gluten-free pizzas are available and all pizzas are available for Take & Bake. The pasta menu rocks! You have to try the lobster mac-n-cheese as well as the Sicilian meatball sliders! Nobody does it better! Don’t forget, you can always dine in…and enjoy the newly updated dining room. Tony Maronni’s, Main Street in Sussex.